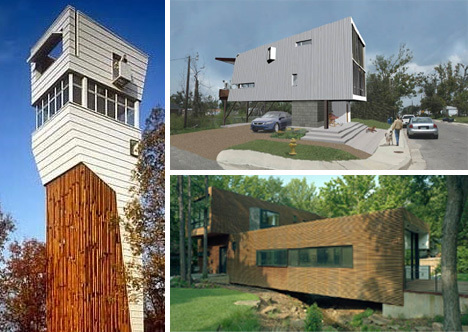 Architect Marlon Blackwell does something with his designs that many architects seem unable or unwilling to do: he takes the building’s environment into consideration when designing a structure. His Southern designs all resonate with their environments rather than fighting with them for attention. His buildings may be modern, but Blackwell ensures that they are always in harmony with their surroundings. 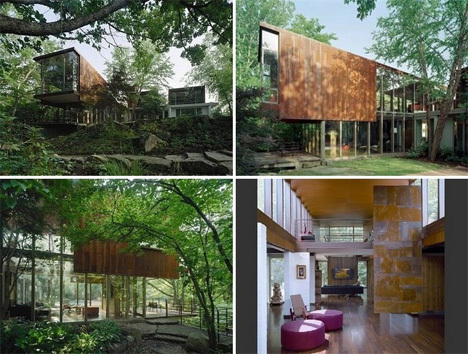 The architect’s designs have won several awards and been featured in numerous books. 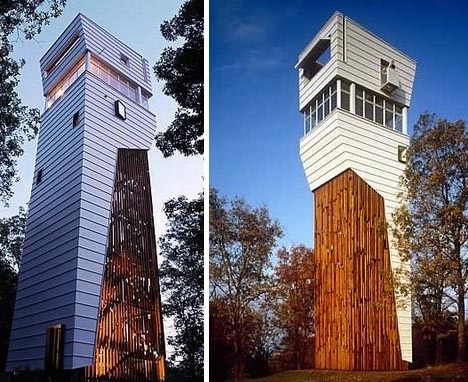 This stunning 80-foot tall tower home/office almost looks like a fire tower converted into a house. But it is a new structure built for a family who wanted to enjoy the stunning views of the Ozarks provided by their 57-acre building site. The structure seems to be at once both natural and industrial, with the wood and the white metal panels each providing complementary yet opposite facets to the design. A steep interior staircase takes one up to the main part of the building, where one room provides a 360-degree view of the landscape. 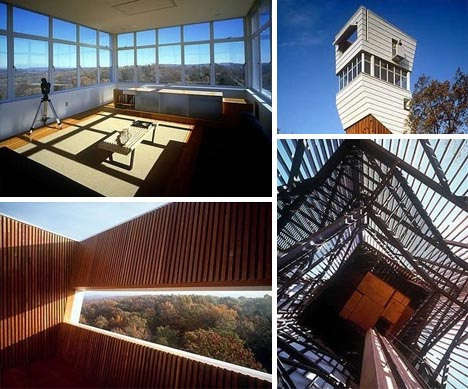 The very top of the tower features an open-roof outdoor room for enjoying even the overhead view. 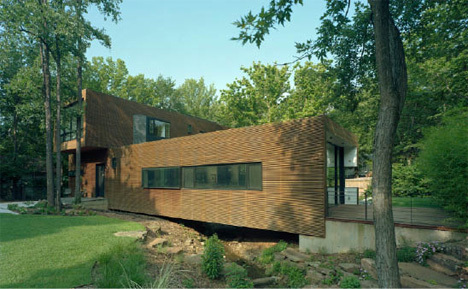 Marlon Blackwell’s firm was called to repair the fire damage to this existing home. They were only allowed to work in the areas that had been damaged. By adding light monitors and suspended lofts, they were able to bring a greater degree of light into the space, making it feel airy and bright. Blackwell won an award for this design in the restoration category, but the judges were somewhat apprehensive to award it: they said the restoration was so successful they couldn’t tell where the old sections of the home ended and the new section began. Blackwell’s own home is equally impressive as his other ventures. The L-Stack House design centers on a glass-surrounded staircase that brings together the public and private sections of the stacked layers. Blackwell, who is also a tenured associate professor at the University of Arkansas, wanted the home to react well to its surroundings: a dense urban neighborhood with a generous dose of nature nearby. 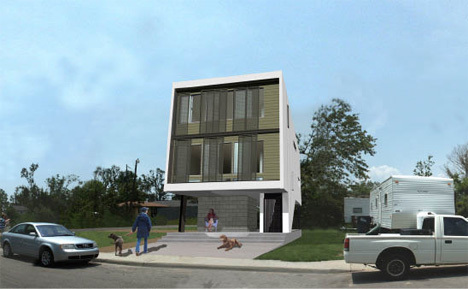 The Porchdog House was designed as a part of the Architecture for Humanity Model Home Program in Biloxi, Mississippi. 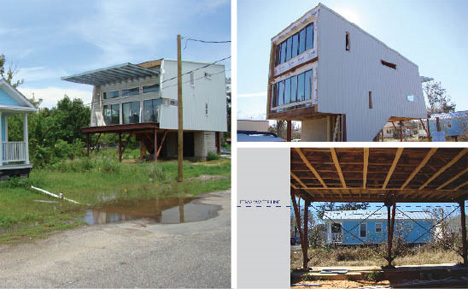 The program is providing affordable prototype houses to families who were displaced by Hurricane Katrina. 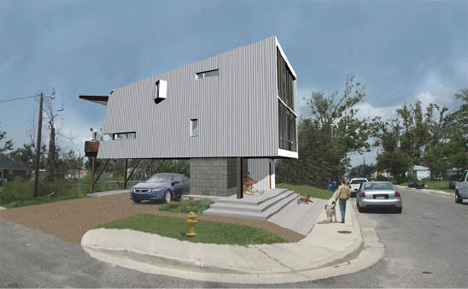 The Porchdog house is raised 12 feet off of the ground, creating a home that is less prone to flooding. However, there is a traditional front-porch culture to maintain in Biloxi, which Blackwell preserved in this design with a ground-level porch and parking area. The resulting home is not only stable in the face of a Category 4 hurricane; it is also an efficient urban design that could conceivably be adopted anywhere in the country.